Yesterday PJ Media posted an article about H.R. 40, the Commission to Study and Develop Reparation Proposals for African-Americans Act. First of all, taking money from a person who earned it and giving that money to a person who did not earn it is called robbery. You can give it nice names, but that is what it is. What about reparations for the indentured servants who came to America? What about reparations for the Irish, Italians, and other ethnic groups that were mistreated when they came to America? This is truly ridiculous. It is a shame that some people are taking it seriously. Many Americans’ ancestors weren’t even here during slavery, why should they pay reparations for something they were never part of? How many Americans lost their lives fighting to end slavery? Are they entitled to anything? How about instead of paying reparations, you begin a program to put fathers back in the homes of families of all races? How about you work on the black culture that says getting an education is a ‘white’ thing? How about you teach children of all races that they have to earn what they get–no one is simply going to give them things? How about you put strict work requirements on welfare and food stamps and limit the number of generations that can collect those benefits? How about we bring back the work ethic instead of the ‘gimme’ ethic? Yesterday The New York Post posted an article about New York City’s shrinking middle class. After decades of sharp income erosion in the face of relentless taxes, escalating living costs and wage reductions through technological changes, the full extent of this shocking exodus is laid bare in the latest US Census data. That shows the city is losing 100 residents each day — with departures exceeding new arrivals. “The rich in New York City are getting richer; the poor are actually getting richer, but not rich enough to be middle class,” said Peter C. Earle, an economist at the American Institute for Economic Research, who has studied other data, noting the expansion in welfare and entitlement programs. Earle said it isn’t unreasonable to assume middle-class incomes are falling even faster in New York City than in other major US cities, because of the city’s high — and rising — housing and other living costs. Thirty-one percent make lower incomes, and the ranks of the rich account for 21 percent of New York City residents. By contrast, in the early 1970s, about 61 percent of New Yorkers were ensconced in the middle class; today, fewer than half are. Recently Amazon opened a facility in Long Island City that received an estimated $3 billion in subsidies, increasing the tax burden on city residents. Although increasing the number of jobs is a good idea, having the taxpayers pay for those jobs is not. National chain-store locations have plunged in the city by 0.3 percent, to 7,849, this year, according to the Center for an Urban Future. And a record 18 chains, including Aerosoles and Nine West, vacated all their city sites in 2018. One sector doing a booming “business” is food pantries. Despite a city unemployment rate of 4 percent, New York food pantries report elevated levels of demand, especially during the holiday season. More than 1 million New Yorkers now worry they won’t have enough food for their families, according to recent studies. Unless something changes in the economic policies of New York City, the city will no longer be the center of commerce and art that it has been. The voters in New York City need to take a good look at where there city is going and make the appropriate political changes. In 1996 The Personal Responsibility and Work Opportunity Reconciliation Act was passed, giving states control of welfare. Building on policies that had been passed by Reagan, and a foundational principle of “personal responsibility,” TANF added work requirements for aid, shrinking the number of adults who could qualify for benefits. This legislation also created caps for how long and how much aid a person could receive, and well as instituting harsher punishments for recipients who did not comply with the requirements. Under President Obama, those requirements were loosened because of the recession. The Republican Congress under President Trump had discussed putting work requirements back, but somehow those requirements didn’t make it into the farm bill. Investor’s Business Daily posted an editorial yesterday about the recently passed farm bill. The article notes that there was bi-partisan support for the farm bill. How bad is the bill? Even Iowa Republican Sen. Charles E. Grassley, himself a farmer, was outraged because the package granted federal subsidies even to distant relatives of farmers that don’t farm. …Scott Faber of the Environmental Working Group, a left-leaning environmentalist organization that has been critical of farm subsidies, notes that more than 1,000 “city slickers” who live in major American cities get farm subsidies. It’s absurd. As Chris Edwards of the Cato Institute points out, farm incomes in 2017 were 32% higher than average U.S. household incomes, while about 60% of subsidies for the three main farm programs went to the biggest 10% of farms. Welfare for the rich. Meanwhile, the the new bill also provides “promotional funds” for farmers markets, research for organic farming, and money to train more farmers. It also grants more money to veteran and minority farmers. Everyone gets a handout, it seems, whether needed or not. 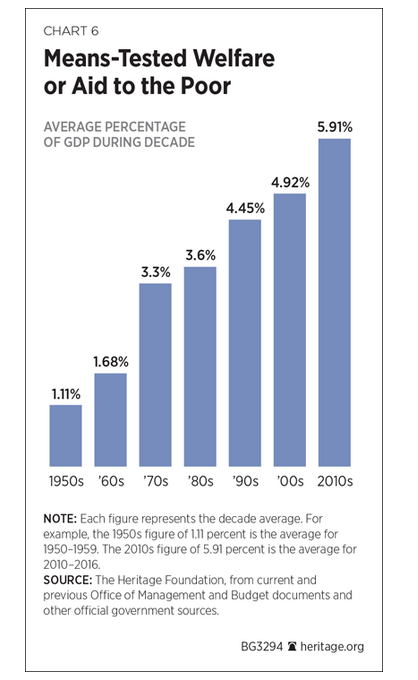 In our increasingly socialized farm economy, nearly everyone is too big to fail. Which means the rest of us pay for it. President Trump, focused on other things, will likely sign this awful Farm Bill. After all, it has that golden seal of congressional approval: It was “bipartisan.” All that means is both sides found ways to rip off taxpayers. Although I object to the word ‘native’ being used in this context, the chart shows that a large portion of our tax money is going to people who are not American citizens. The real problem with this is that veterans and other Americans are not getting the services they need because money is limited and our national debt is skyrocketing. Supporting people who are here illegally is simply a luxury we can no longer afford. In 2014, 63 percent of households headed by a non-citizen reported that they used at least one welfare program, compared to 35 percent of native-headed households. Welfare use drops to 58 percent for non-citizen households and 30 percent for native households if cash payments from the Earned Income Tax Credit are not counted as welfare. EITC recipients pay no federal income tax. Like other welfare, the EITC is a means-tested, anti-poverty program, but unlike other programs one has to work to receive it. 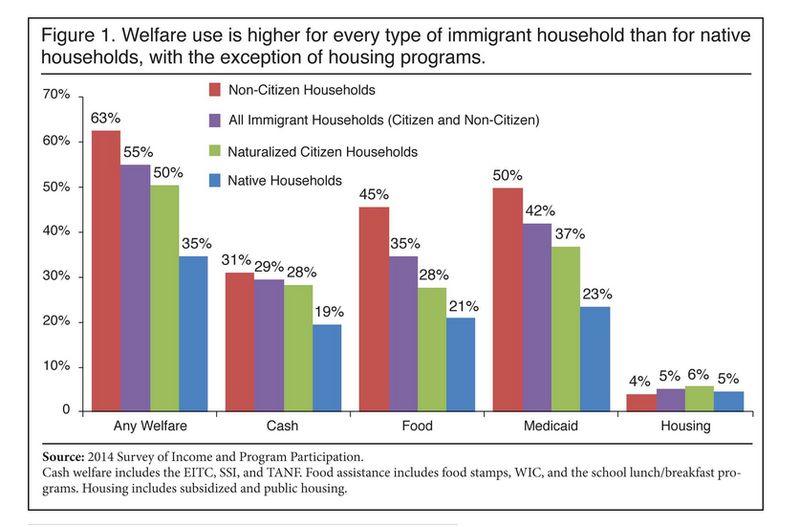 Including the EITC, 31 percent of non-citizen-headed households receive cash welfare, compared to 19 percent of native households. If the EITC is not included, then cash receipt by non-citizen households is slightly lower than natives (6 percent vs. 8 percent). I am reminded of the line from the movie “Men In Black,” “We’re not hosting an intergalactic kegger down here.” We can do everything we can to help people in poor countries, but we need to understand that until those countries have some form of economic freedom, our aid simply goes to the corrupt officials at the top. The answer to the number of illegals coming to America is for those illegals to gather together to fight the corrupt governments in their own countries. Based on the fact that the large majority of the people currently trying to break into America are military-age men, we need to ask them to go back home and work to fix things. We simply cannot afford to taken in everyone in the world who is looking for a better life. At some point you simply cannot put any more people on the bus. On Tuesday The Daily Wire posted an article about some recent information from the Department of Homeland Security. The Department of Homeland Security revealed Tuesday that the threat of “fake families” declaring asylum together at the United States’ southern border is no joke; more than 150 illegal immigrant “families” have used non-familial children or adults to attempt to convince border patrol agents to allow them to remain in the country. The thing to remember here is that there are people in various countries in South American coaching people on how to break into America. If that is a harsh word, I’m sorry–it is what is happening. I will admit that our immigration system needs serious reform, but that is no excuse for people thinking they can simply come here illegally and stay. Right now America is severely in debt. We have neglected our veterans and are not doing a good job of taking care of anyone. We cannot afford to be overrun with non-citizens who want to be taken care of. Inspired by the August 1965 riots in the black district of Watts in Los Angeles (which erupted after police had used batons to subdue a black man suspected of drunk driving), Cloward and Piven published an article titled “The Weight of the Poor: A Strategy to End Poverty” in the May 2, 1966 issue of The Nation. Following its publication, The Nation sold an unprecedented 30,000 reprints. Activists were abuzz over the so-called “crisis strategy” or “Cloward-Piven Strategy,” as it came to be called. Many were eager to put it into effect. The key to sparking this rebellion would be to expose the inadequacy of the welfare state. Cloward-Piven’s early promoters cited radical organizer Saul Alinsky as their inspiration. “Make the enemy live up to their (sic) own book of rules,” Alinsky wrote in his 1971 book Rules for Radicals. When pressed to honor every word of every law and statute, every Judaeo-Christian moral tenet, and every implicit promise of the liberal social contract, human agencies inevitably fall short. The system’s failure to “live up” to its rule book can then be used to discredit it altogether, and to replace the capitalist “rule book” with a socialist one. This may well be what the caravans are actually about. If this theory is too wild for you, step back and look at the movement toward socialism in the recent election. Are You Coming To America To Add To America Or Take From America? The Washington Examiner posted an article Thursday about new rules from the Department of Homeland Security. We need to remember that up until 1965, there was no welfare for immigrants (or Americans) to collect. People who came to America came in search of opportunity–not handouts. The authors of a 2017 study by the National Academies of Sciences, Engineering, and Medicine believed more immigration to be a good thing — and yet still found that nearly 60 percent of noncitizen, non-naturalized, immigrant-led households used some kind of welfare from 2011-2013. That’s compared to just 42 percent of homes led by native-born citizens. A 2015 study by the Center for Immigration Studies, a group that advocates restricting immigration, found basically the same thing only looking at data for 2012. The study said that immigrant-led households consumed double the Medicaid and food assistance benefits that native ones did. Overall, 51 percent of immigrant-led homes used “any welfare,” compared to 30 percent for native homes. There is a school of thought that says that illegal immigrants are prevented from collecting welfare, but that is not true. Under current law, if immigrants have a baby on U.S. soil, as a default citizen, he’s instantly eligible to bring in welfare for the family. Or, if one immigrant marries a citizen, the wait time for benefits shrinks from five years to three. If the immigrants have any children under 18, they’re all allowed benefits, too. In addition to that, all refugees and asylees, 13 percent of legal residents, according to the report by the Center for Immigration Studies, are eligible for full benefits. Aside from being expensive, this is simply not acceptable. We need to go back to a time when churches and community organizations helped families on the local level. These groups knew who was in need and who was freeloading. Now we have a giant bureaucracy administering a program with the knowledge that if less people are on welfare the bureaucrats will lose their jobs. There is no incentive to actually get people off of welfare. That needs to change. New regulations will be the beginning of that change. Yesterday Scott Johnson (one of the regular writers at Power Line Blog) posted an article at The City Journal website. The article was related to some recent events involving large amounts of cash flowing from Minnesota to Somalia. The article goes on to explain that beginning in the 1990’s, the State Department began sending refugees from the Somalia civil war to be resettled in Minnesota. Minnesota now has the largest population of Somalis outside of Somalia. As the Washington Times noted in 2015, in Minnesota, these refugees “can take advantage of some of America’s most generous welfare and charity programs.” Professor Ahmed Samatar of Macalester College in St. Paul observed, “Minnesota is exceptional in so many ways but it’s the closest thing in the United States to a true social democratic state.” A high-trust, traditionally homogenous community with a deep civil society marked by thrift, industriousness, and openness, Minnesota seemed like the ideal place to locate an indigent Somali population now estimated at 100,000. Fast forward to 2015 when the House Homeland Security Committee task force on combating terrorist and foreign-fighter travel discovered that Minnesota led the nation in contributing foreign fighters to ISIS. It gets worse. The refugees masterminded a very lucrative daycare fraud scheme that sent millions of taxpayer dollars to terrorists in Somalia. These are not the sort of refugees we need. The U.K. Daily Mail posted an article today about the long-term impact of consistently smoking marijuana. The study followed children from birth up to the age of 38 and found people who smoked cannabis four or more days a week over many years ended up in a lower social class than their parents. It also found that regular and persistent users ended up with lower-paying, less skilled and less prestigious jobs than those who were not regular cannabis smokers. Financial, work-related and relationship difficulties were further experienced by those taking the drug, which worsened as the number of years of regular cannabis use progressed. ‘Our research does not support arguments for or against cannabis legalization,’ said Cerda. ‘But it does show that cannabis was not safe for the long-term users tracked in our study. One of the things that amazes me is the move to legalize marijuana in America while stigmatizing smoking tobacco. Both are damaging to the lungs, both ingest various toxins into the body, but smoking tobacco does not generally impact your social or financial success. Marijuana is not a harmless drug, and it is not a good idea to legalize the use of recreational marijuana until there is more study of its long-term effects. It is also very naive to believe that saying that recreational marijuana, legal in some states for people over twenty-one, will not be used by those under twenty-one. Teenagers using marijuana on a regular basis will not be of benefit to our society. It Doesn’t Pay To Work Anymore! Yesterday the U.K. Daily Mail posted an article about what is happening to the British workforce–it is growing and unemployment is going down! A record 3,100 people every day are finding work as Britain’s jobless total falls at the fastest rate in 17 years. The number of unemployed tumbled to 2.32million – falling by 167,000 between September and November, the biggest drop since 1997. Yesterday the Office for National Statistics said the unemployment rate is now at 7.1 per cent after falling faster than any economist or the Bank (Bank of England) predicted. Meanwhile, Congress in America is debating extending unemployment benefits. Statistics have shown that people collecting unemployment insurance tend to intensify their search for work as their unemployment benefits begin to run out. Extending unemployment or increasing welfare benefits does not encourage people to join the work force–it destroys motivation. In most cases, it is simply more fun not to have to get up and go to work every morning. When the government subsidizes not working, more people don’t work. I am not saying that we should end unemployment or welfare, but we should put enough restrictions on both to prevent generations of America who have not grasped the concept of working for a living. America needs to follow the example of Great Britain. Investor’s Business Daily posted an article today stating that the Netherlands is changing the rules of its welfare state. The Netherlands has been known for its generous welfare system. Three decades ago, when the U.S. was spending about 22% of its GDP on entitlement programs, the Dutch were spending more than 40%. The Financial Times named the Dutch system a “comprehensive egalitarian social model” built in the 1960s and 1970s. Among the changes is a requirement that welfare applicants must prove they have actively looked for a job for at least four weeks before they can receive benefits. “And once they begin to receive benefits they will either have to work or perform volunteer community service,” says the Cato Institute‘s Michael Tanner. Other savings will be found when youth services, care for the elderly and job retraining are kicked down to the local level, which is better equipped to be more efficient with other people’s money. The Dutch have learned that those who work cannot support those who do not work indefinitely. Eventually those who work get very tired and decide to join the non-workers. If we do not learn the lesson the Dutch have learned, we can also expect to have to make drastic changes in the near future. In 1995, the Cato Institute published a groundbreaking study,The Work vs. WelfareTrade-Off, which estimated the value of the full package of welfare benefits available to a typical recipient in each of the 50 states and the District of Columbia. It found that not only did the value of such benefits greatly exceed the poverty level but, because welfare benefits are tax-free, their dollar value was greater than the amount of take-home income a worker would receive from an entry-level job. 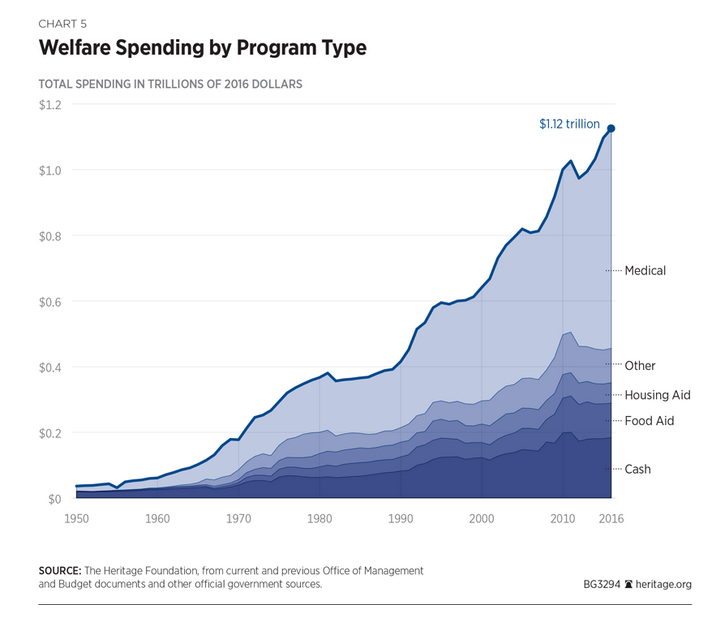 Since then, many welfare programs have undergone significant change, including the 1996 welfare reform legislation that ended the Aid to Families with Dependent Children program and replaced it with the Temporary Assistance to Needy Families program. Accordingly, this paper examines the current welfare system in the same manner as the 1995 paper. Welfare benefits continue to outpace the income that most recipients can expect to earn from an entry-level job, and the balance between welfare and work may actually have grown worse in recent years. The current welfare system provides such a high level of benefits that it acts as a disincentive for work. 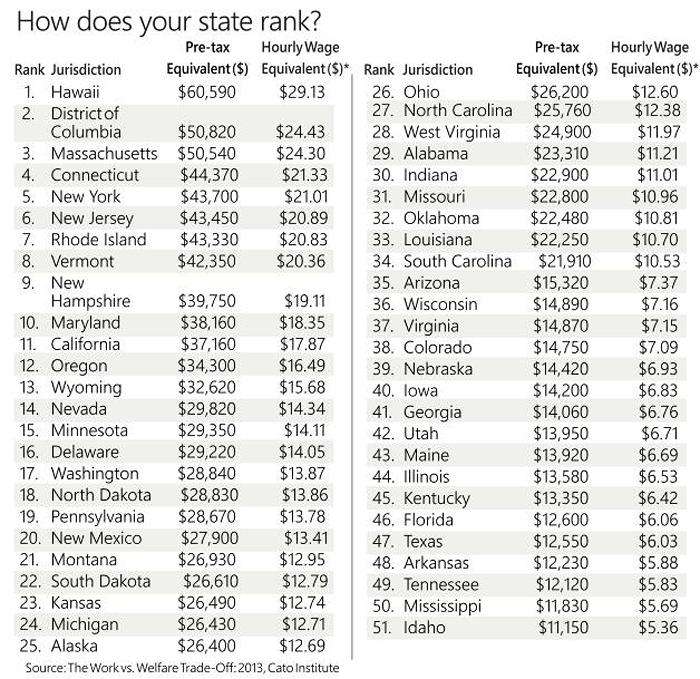 Welfare currently pays more than a minimum-wage job in 35 states, even after accounting for the Earned Income Tax Credit, and in 13 states it pays more than $15 per hour. If Congress and state legislatures are serious about reducing welfare dependence and rewarding work, they should consider strengthening welfare work requirements, removing exemptions, and narrowing the definition of work. Moreover, states should consider ways to shrink the gap between the value of welfare and work by reducing current benefit levels and tightening eligibility requirements. One of the things that has made America great has been the willingness of Americans to work hard, knowing their diligence would be rewarded. When the government creates a situation where staying home doing nothing pays as well as working, it undermines the work ethic in America and weakens our country. It might also be a good idea to examine the role the tax burden plays in this–does the working person earn less because of the tax burden that comes with working? Is the welfare recipient subject to a lesser tax burden? The bottom line here is simple. People are not stupid. If a person can make as much money not working as he would working, why should he work? I recently posted a story with a striking example of this philosophy at rightwinggranny.com. We need to reinstate the work requirements to receive aid, and we need to be more aware of who is getting aid so that we can limit fraud. It’s time to make sure that the people who are working hard are rewarded for their hard work. The war on poverty began in the 1960’s. In 1959, the poverty rate was 22.4%. In 1969, shortly after the war on poverty began, the poverty rate was 12.1%. Today the poverty rate is 16.1%. It looks to me as though we are losing ground–not gaining it. 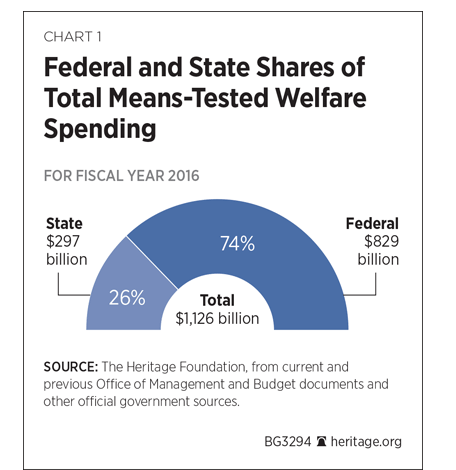 Federal and state governments spend a trillion dollars a year just on these means tested welfare programs, which does not include Social and Medicare. That is more than we spend on national defense. It adds up to roughly $17,000 per person in poverty, over $50,000 for a poor family of three. The Census Bureau estimates that our current welfare spending totals four times what would be necessary just to give all of the poor the cash to bring them up to the poverty line, eliminating all poverty in America. A recent book by Charles Murray, In These Hands, further documents that. 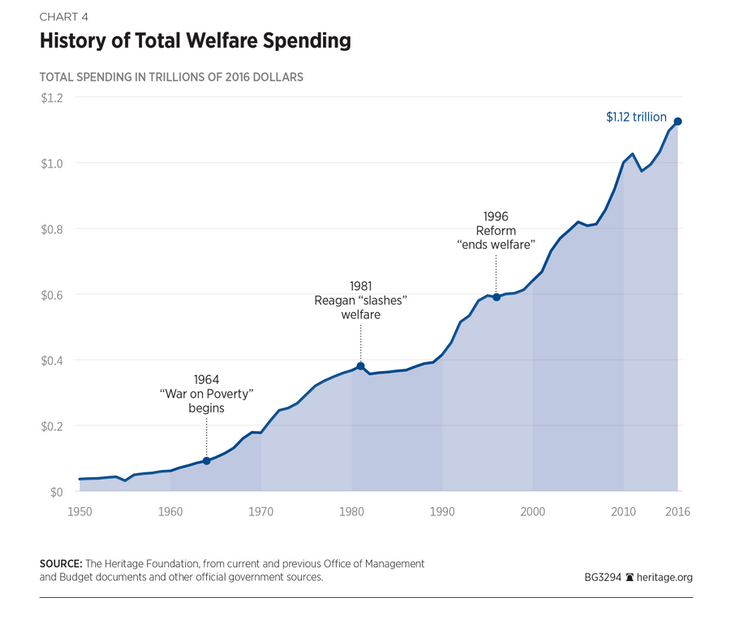 The article also points out that from 1965 to 2008 the total amount of money spent on means tested welfare is nearly $16 trillion–in 2008 dollars. That is double the amount America has spent on military conflicts from the Revolution until today. One major reason that poverty stopped declining after the War on Poverty started is that the poor and lower income population stopped working. In 1960, nearly two-thirds of households in the lowest income one-fifth of the population were headed by persons who worked. But by 1991, this work effort had declined by about 50%, with only one-third of household heads in the bottom 20% in income working, and only 11% working full-time, year round. 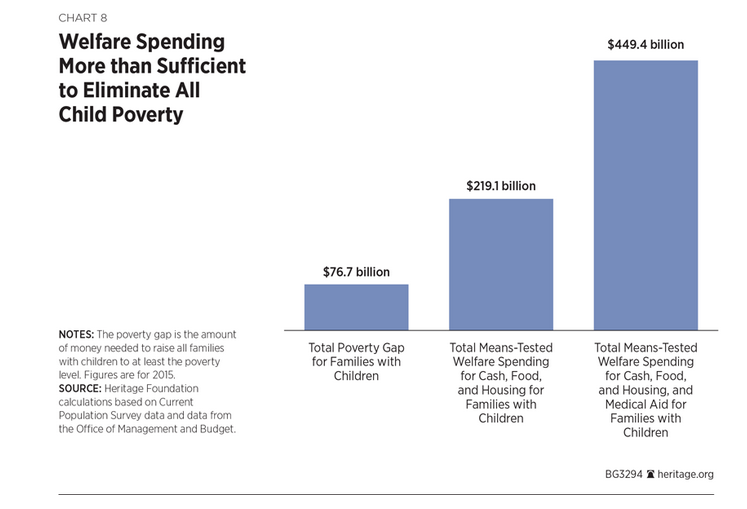 The war on poverty has also destroyed low-income families and increased the number of out-of-wedlock births. It has increased the number of one parent homes and children with two unmarried parents. Please follow the link above and read to entire article. The article explains the negative impact the war on poverty has had on our society. It also explains how to solve some of the problems associated with the way the current welfare state is funded. We need to change the way we help those among us who are less fortunate. What we are currently doing is not working. Would Taxpayer Money Flow So Freely If The Taxpayers Were In Charge Of Spending It? Yesterday I posted an article about the number of dead people collecting welfare benefits in Massachusetts (rightwinggranny.com). Well, it seems as if Massachusetts is not the only state that can’t keep track of where welfare dollars are going. Yesterday the New York Times reported that prisoners in New Jersey had erroneously received welfare benefits. Over a 22-month period, New Jersey paid nearly $24 million in unemployment, welfare, pension and other benefits to 20,000 people who did not qualify for them because they were in prison, according to a report from the state comptroller released on Wednesday. One of the questions that immediately comes to mind when I read that last paragraph is, “What were the state employees doing in prison and how long were they there?” Can you imaging anyone in the private sector having enough sick leave to cover a prison term? I think we can safely conclude at this time that the ‘safety net’ is broken. It’s not broken because it is not helping people who genuinely need it–it is broken because it is subsidizing lifestyles of people who do not need or deserve to be subsidized. I suspect that what has happened in Massachusetts and New Jersey regarding welfare payments going to people who were either dead or not entitled to them is only the tip of the iceberg. We have people in this country working hard, scrimping to get buy, and being taxed to death to support fraud. It’s time we held states accountable for how they spend taxpayers’ money. If a state is not doing a good job, it’s time to elect new officials. Voters need to pay attention and take a stand. I know that there are a lot of people collecting welfare benefits and that makes it hard to keep track of every penny, but Massachusetts has taken inefficiency to a new level. WCVB reported yesterday that an audit of the Massachusetts Department of Transitional Assistance identified 1,164 cases where recipients continued to receive a total of $2.39 million in benefits from six to 27 months after they were reported to be deceased. The report, which covered food stamps, cash, and other benefits to low-income families, estimated that recipients using a dead person’s Social Security number alone received at least $2.4 million in between July 2010 and April 2012. It also flagged another $15 million in suspicious transactions from electronic benefit cards during the two-and-a-half-year period the auditor reviewed. The state auditor also found another $15 million in suspicious transitions on electronic benefit cards – including nearly $5 million where all the food benefits were withdrawn at once; $4.6 million in transactions from distant states or territories (including Hawaii, Florida, and Puerto Rico); $3.6 million where recipients made multiple purchases or withdrawals within an hour; $1.5 million where recipients regularly rang up transactions in even dollar amounts (such as $100) and $840,000 where a card number was manually entered into a retail terminal instead of being swiped (suggesting a card user may have stolen the card number, but didn’t have the actual card). This is taxpayers’ money. If those responsible for spending it cannot do a better job of being responsible, we should stop giving them the money. On Friday, CNS News posted a story quoting Black Entertainment Television (BET) founder Bob Johnson as saying that America would “never tolerate white unemployment at 14 or 15 percent” and yet unemployment for the black community has been double that of white Americans for over 50 years. That statement is true, and that fact is evidence of something wrong with our education and employment system as it currently exists. However, before we yell racism, let’s look at some of the things that surround black unemployment. In 1962, Daniel Patrick Moynihan, a Senator from New York who was very concerned about how American welfare programs were impacting the black family, noticed that because of the changes made to the welfare system, the number of black households without fathers present was increasing dramatically (City Journal Summer 2005). Before then, welfare was provided to families below a certain income whether or not the husband and father was living in the house. Welfare was changed in the 1960’s so that it was financially advantageous for a husband and father not to be living in the home. At that point, the black culture changed from one of strong families to one of single mothers. (Just for the record, much of the white culture is following the same path). Single-parent families are statistically much more likely to live below the poverty level than two-parent families. High unemployment rates for blacks are a problem. High unemployment rates for anyone are a problem. If Bob Johnson is truly concerned about black unemployment, he needs to move within the black culture to support families, family values, and good education from kindergarten through college. One attempt at this, the Head Start Program, has yielded unimpressive results. We can do better. It is now 45 years later. We spend more than $7 billion providing Head Start to nearly 1 million children each year. And finally there is indisputable evidence about the program’s effectiveness, provided by the Department of Health and Human Services: Head Start simply does not work. So how do we change the black unemployment numbers? Actually, the place to start is the government. First of all, Obamacare is having a negative impact on employment for everyone–repeal it. 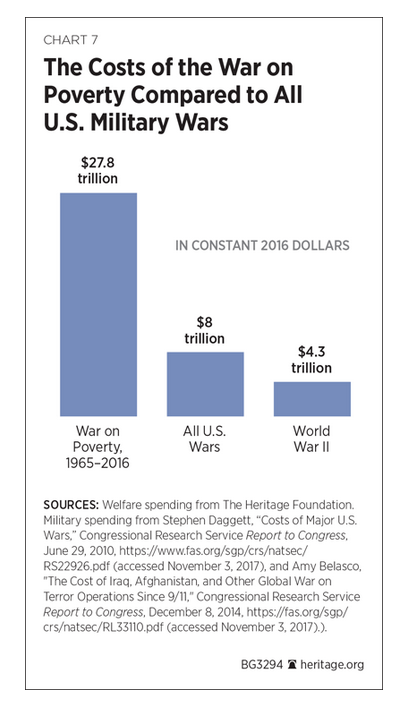 Second of all, we need to take a good look at welfare programs and how they impact the people who receive the money (and while we are at it, examine the administrative cost). Third, we need community leaders who support black families and encourage black children to speak proper English, get a good education, get married after they finish school, and have children after they get married–not before. We then need to revise our welfare programs so that they promote intact families, and do not promote dependence upon the government. We need workfare programs–first of all to make welfare less attractive, and secondly to provide the experience (and expectation) of getting out of bed every morning and going to work. Workfare also provides experience in doing some sort of work–whatever it is. We need to re-educate both the black and white communities on the free enterprise system to allow those who can be entrepreneurs to do so (we also need to modify our tax system so that it pays to be an entrepreneur). We need black leaders who do not preach dependence. We need black leaders who do not preach hatred and blame. We need black leaders who want to bring the black community into equality with the white community in the areas of education, housing, opportunities, and success. That can be done by promoting responsibility, patriotism, cooperation with authority, and basic values. Racism, hatred, and blame will get us nowhere. We need a positive approach. Anyway. The Boston Herald is reporting today that the glitch in the Massachusetts welfare department has cost the Massachusetts taxpayers $3.4 million in overtime. More than 900 employees in the Department of Transitional Assistance (DTA) — mostly caseworkers — shared in the $3.4 million OT bonanza between November 2010 and May 2011, the department acknowledged after a Herald public records request. DTA authorized the wages — an average of roughly $3,500 each — so staff could address a backlog of 30,000 clients whose eligibility had to be recertified after the agency overpaid food-stamp clients by $27 million in federal money. I suppose we should be grateful that at least the overpaid food-stamp clients were paid with federal money. Federal money–are these the same people who keep telling us they can’t cut spending? The welfare department has been undergoing a shake-up since ex-Commissioner Daniel Curley was forced to resign on Jan 31, after a devastating inspector general’s report claiming another $25 million in taxpayer money is going to welfare recipients who aren’t eligible. Hopefully she will continue to hold the Massachusetts government responsible for their total mismanagement of taxpayer money. Remember the dust up in Massachusetts when before the election when the state Welfare Department sent out voter-registration forms to welfare recipients? There were links between the Elizabeth Warren campaign and the state-funded campaign to register voters, but that was quietly swept under the table by the media. There is another part of the story, however, that may be even more interesting to follow. Today’s Boston Herald posted an article explaining that many of the forms sent were returned as undeliverable. The Department of Transitional Assistance contacted 477,000 welfare recipients who were on their books from June 1, 2011, to May 31, 2012, after settling a voter-rights lawsuit brought by Democratic-leaning activist groups that demanded an aggressive voter information effort by the state. That $274,000 push by DTA resulted in 31,000 new voter registrations — but revealed an alarming number of welfare recipients whose residency in Massachusetts can’t be confirmed. The article reports that many of these welfare recipients continue to receive their benefits through direct deposits to their bank accounts although the state has no way of knowing whether they still live in the state. This is just one example of how well the states manage the money taxpayers give them. The biggest mistake we ever made in America was putting an income tax in place. Prior to 1913, there was no federal income tax, although one had been levied briefly during the Civil War and was later repealed. The second biggest mistake was using withholding to pay the tax. If everyone realized how much they were actually paying in taxes, Americans might demand that the government shrink to a reasonable size! Tragically, this massive welfare state has been a driver of dependency. Today, 100 million Americans—roughly one-third of the U.S. population—receive aid from a government welfare program (not including Social Security, Medicare, or unemployment insurance). As Ryan noted, in the 1990s Congress passed the historic welfare reform law, inserting work requirements into the largest federal cash assistance program. This was a huge success. But these reforms are at risk. In July of this year, the Obama Administration announced it would remove work requirements from welfare reform—the very element that made the law such a success. At what point will this kind of institutionalized dependency result in the loss of America as we know it? John Hinderaker at Power Line posted an article yesterday about some changes made to the U. S. Citizenship and Immigration Services Website and the information packets given to new immigrants. The website (and the packets) now promote federal welfare benefits. Rather than ensuring that immigrants will not become liabilities to the public purse, the Obama administration explicitly lures them to the U.S. with promises of lavish welfare benefits–a policy that is both illegal and perverse. This web site promoting federal welfare benefits, now the largest item in the federal budget, mirrors information that is included in packets given to new arrivals in the U.S.
“The Department of Homeland Security’s effort to enroll immigrants in welfare raises serious legal, social, and financial issues. Federal law prohibits the granting of visas to those likely to be welfare reliant, yet DHS actively promotes these benefits to millions of new arrivals every year. DHS knows this, which is perhaps why they refuse to comply with an oversight request on this very issue from the Ranking Members of four Senate Committees. It is a long-held principle of immigration that those seeking a life in America are expected to be able to care for themselves financially and contribute to the financial health of the nation. The Administration’s actions show this principle is no longer in effect. Encouraging self-sufficiency must be a bedrock for our immigration policy, with the goal of reducing poverty, strengthening the family, and promoting our economic values. But Administration officials and their policies are working actively against this goal. At the same time, those who would be self-sufficient are denied or delayed in their admittance. This is of course a financial issue as well. 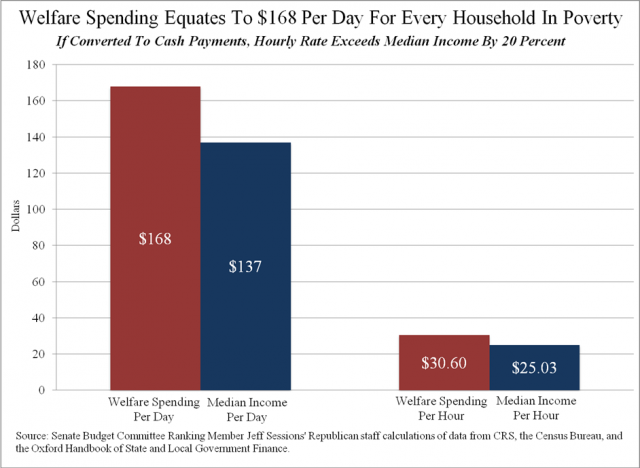 America spends enough each year on welfare to equal $60,000 for every household beneath the poverty line. 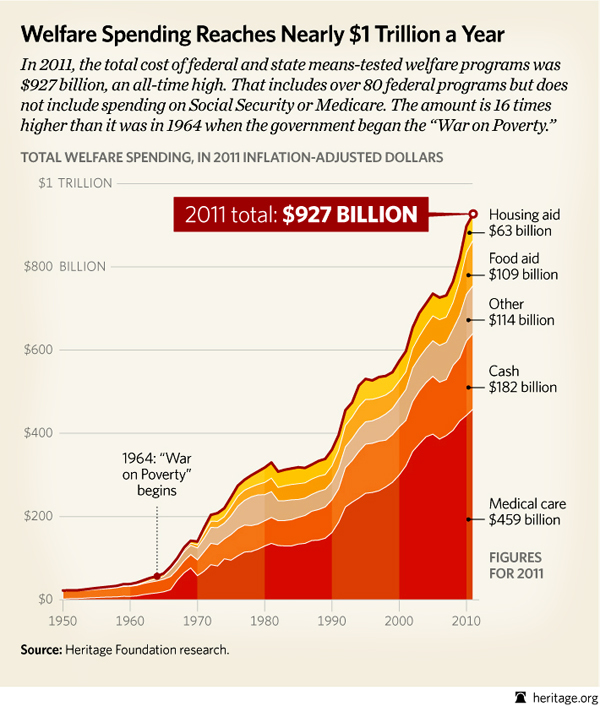 Welfare is now the largest item in the budget and is projected to grow another 30 percent in the next four years. We should not pursue an immigration policy that places even more strain on the funding for domestic programs. The Foundry at Heritage.org posted an article today about President Clinton’s remarks in his speech last night that President Obama has not gutted the work requirements passed in the Welfare Reform Act during the Clinton Administration. The Heritage Foundation pointed out some basic facts that contradict this statement. The Obama Administration will put in mothballs the formal purpose of welfare reform—to reduce the number of people dependent on government benefits. The Administration will abandon the legislative performance goal that encourages states to reduce welfare caseloads. It will weaken the “work participation” standards that require some 30 percent of able-bodied Temporary Assistance for Needy Families (TANF) recipients to engage in work activities for 20 to 30 hours per week. The changes that the Obama Administration has made to welfare reform will create more dependency–not encourage people to find work and contribute to society rather than take from it. In the typical state, 1.5 percent of the TANF caseload leaves welfare and obtains work each month. Thus, any state can be fully exempted from the TANF work requirements if it raises the number of exits to 1.8 percent. This is a miniscule change. What will the other 98.2 percent of the caseload be doing? No one knows for sure. But one thing we do know for certain: They will be exempt from the federal “work participation” requirements established in the welfare reform law. I realize this may seem a little trivial, but it is not–for two reasons. First of all, the change in the law encourages dependency on the government–never a good thing, and second of all, it is obvious that President Clinton was lying. It is also obvious that the mainstream media is not going to report that President Clinton was lying. It is truly time for a housecleaning in Washington. At the same time we initiate housecleaning, we need to impose term limits, end retirement pay for Congressmen (put them under Social Security or other programs they have to contribute to), and refuse to pay Congress if they do not pass a budget. These ideas may seem a little drastic, but these are drastic times. What Are The Rights Of A Private Vendor ? Today’s Boston Herald posted a story about Andrea Taber, owner of the Ever So Humble Pie Co. in Walpole. Ms. Tabor sells her pies at the Braintree market on Fridays. She has caused a controversy by refusing to accept Electronic Benefit Transfer (EBT) cards as payment for her pies at the market. “I don’t think American taxpayers should be footing the bill for people’s pie purchases,” said Andrea Taber, proprietor of the Ever So Humble Pie Co. in Walpole, who peddles her wares at the Braintree market on Fridays and now finds herself in the middle of the state’s raging fight over welfare benefits. Businesses must apply and be approved to accept EBT cards, and normally are not obliged to do so. Department of Transitional Assistance Commissioner Daniel Curley said the state wants welfare recipients to “access healthy food,” but he declined to weigh in on whether farmers markets that choose to accept EBT cards can compel their vendors to take part. I have very mixed emotions on this issue. I would like to think that EBT cards are used to make healthy food purchases, but I really don’t like the idea of anyone being able to control another person’s food purchases. The issue is complicated by the fact that the taxpayers are paying for those food purchases, but it still feels intrusive to me. It will be interesting to see how this controversy ends.